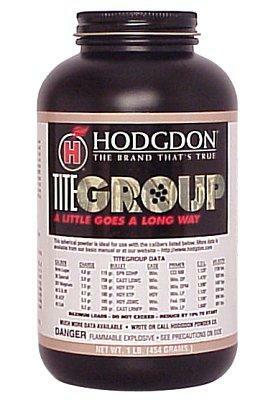 Hodgdon Titegroup Pistol/shotgun 1 lb 1 | Burbank Ammo & Guns, Inc.
As the name implies, this spherical propellant was designed for accuracy. Because of the unique design, this powder provides flawless ignition with all types of primers including the lead-free versions. Unlike pistol powders of the past, powder position in large cases (45 Colt, 357 Magnum and others) has virtually no effect on velocity and performance. Cowboy Action, Bullseye and Combat Shooters should love this one! Titegroup has it all, low charge weight, clean burning, mild muzzle report and superb, uniform ballistics. Available in 1 lb., 4 lb. & 8 lb. containers.